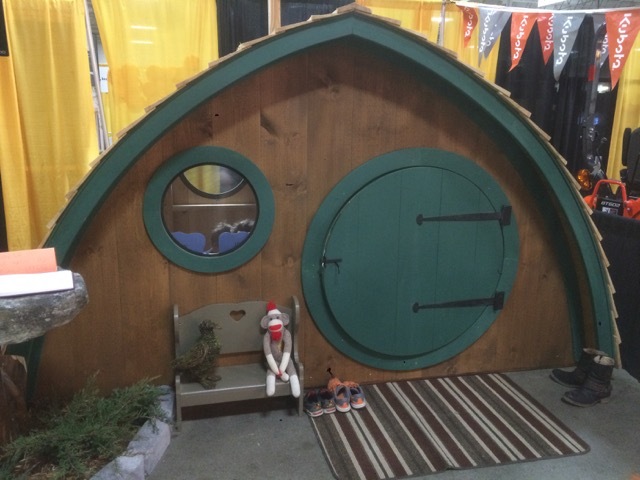 We have a rotating inventory of pre-built Hobbit Holes that are available for delivery only. These are finished "top of the line" models that we build to showcase our products and we like to maintain a fresh inventory so we're always putting our best foot forward to potential customers both in person and online. Please contact us for a delivery quote on any of the models listed below. 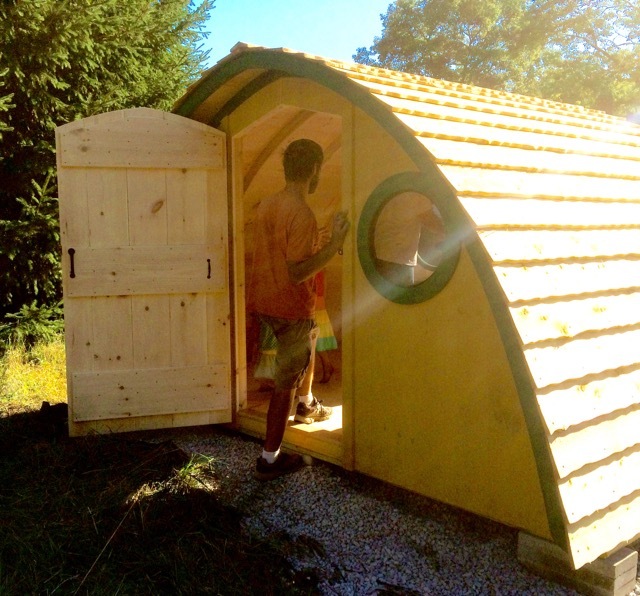 To have the pre-built structure unloaded in the precise location where you want the Hobbit Hole to sit, there must be sufficient access to the site for a pickup truck and trailer to drive up to the site. We can unload the structure for you at your site, but moving the structure once it is unloaded will incur an additional charge (for renting equipment that will be needed to move it). For sites with limited accessibility, we can also deliver and assemble a kit for you on-site for an additional charge. Finished exterior as shown and with our custom "live edge" cedar clapboard roofing. This Model is SOLD. Please contact us for a quote to build one just for you! 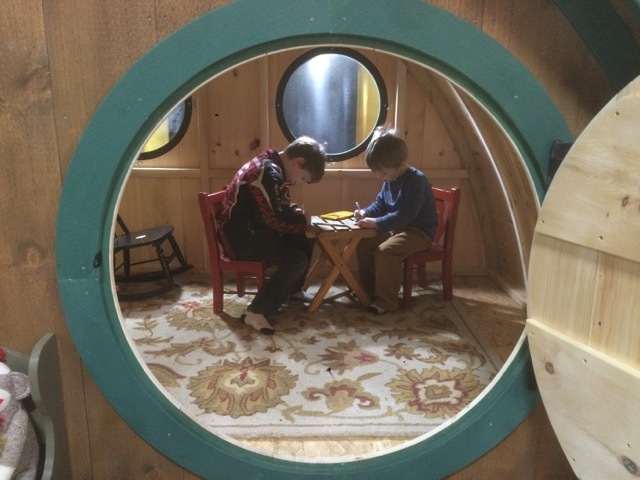 The Big Merry has a great "clubhouse" feel for kids of any age. Floor base is 10' x 6' and the floor to ceiling height at the center is 5.5'. Our playhouses are also available to be shipped as a kit. Orders typically ship in 2-4 weeks. Contact us or visit our online store for more information. 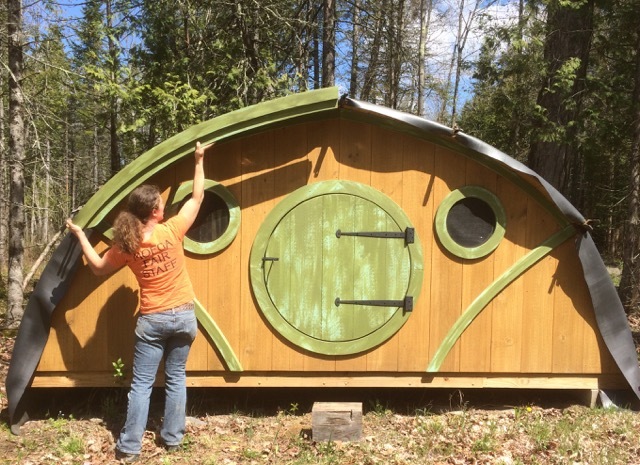 The adult-sized "Faehaven" is our most versatile design, with plenty of room for a wide variety of uses for both adults and children alike. 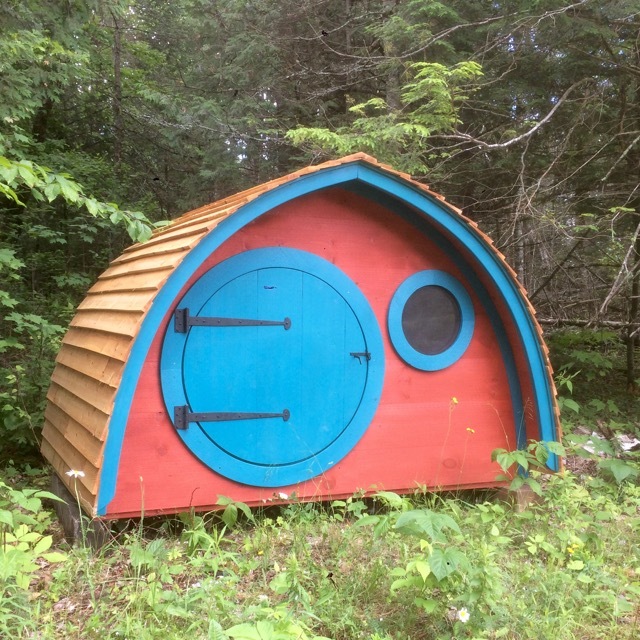 There is an irregular patina/graying pattern on the roofing (will blend in over time), and a few courses of roofing have been replaced (where the holes we put in the roof to mount our big "Wooden Wonders" sign at shows were), so we can offer this less-than-perfect Hobbit Hole for a GREAT price! Floor base dimensions: 12' x 6'8". ​A pre-finished wide plank pine floor can be added for $595. The Faehaven is also available to be shipped as a kit. Orders typically ship in 2-4 weeks. ​Floor dimensions on the Little Merry are 7'6" x 4'. Comes with a 3' diameter round front door, one 16" round window offset from the front door, and one 20" round window centered on the back wall. Email us or call 855-462-2484 ​for a shipping or delivery quote. Price listed does not include site preparation or installation/ landscaping, which are significant aspects of a completed "Bag End" project. Wooden Wonders is available to perform Bag End installations on a limited basis. The floor dimensions of the Bag End measure 14' x 6'. Once landscaped, the overall footprint of the project is larger. The style of landscaping has a significant influence on the final footprint of the landscaped playhouse. The recommended minimum footprint to allow for is 22' wide by 14' deep. We also provide landscaping services on the Bag End if desired. The pre-built Bag End available is shown at left has been pre-treated with exterior stain. 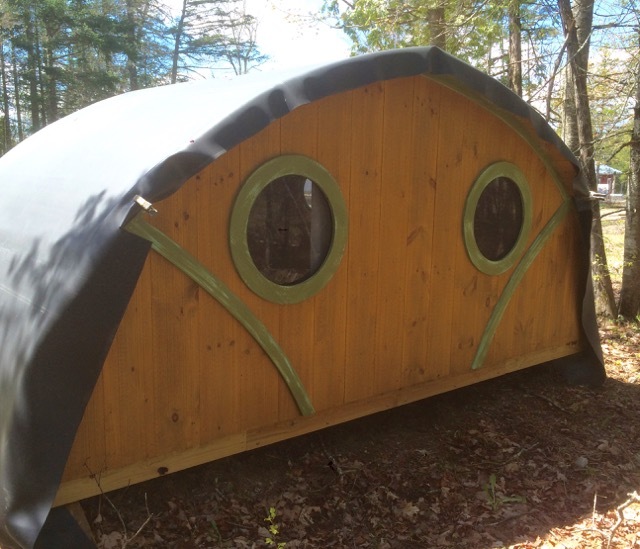 Price listed also includes waterproof roofing layers and fascia (not shown in photos). High quality construction using northern white cedar, treated lumber, a massively reinforced roof structure using multiple layers of waterproof membrane, and stainless steel fasteners all assure that your investment will return years of beauty and enjoyment. Representative photo of an installed "Bag End"
The Bag End is also available to be shipped as a kit. Orders typically ship in 6-8 weeks. ​ Contact us for pricing and availability.